This is step 6 of a free "NerdDinner" application tutorial that walks-through how to build a small, but complete, web application using ASP.NET MVC 1. Step 6 shows how enable support for richer form editing scenarios, and also discusses two approaches that can be used to pass data from controllers to views: ViewData and ViewModel. We've covered a number of form post scenarios, and discussed how to implement create, update and delete (CRUD) support. We'll now take our DinnersController implementation further and enable support for richer form editing scenarios. While doing this we'll discuss two approaches that can be used to pass data from controllers to views: ViewData and ViewModel. One of the defining characteristics of the MVC pattern is the strict "separation of concerns" it helps enforce between the different components of an application. Models, Controllers and Views each have well defined roles and responsibilities, and they communicate amongst each other in well defined ways. This helps promote testability and code reuse. When a Controller class decides to render an HTML response back to a client, it is responsible for explicitly passing to the view template all of the data needed to render the response. View templates should never perform any data retrieval or application logic – and should instead limit themselves to only have rendering code that is driven off of the model/data passed to it by the controller. Right now the model data being passed by our DinnersController class to our view templates is simple and straight-forward – a list of Dinner objects in the case of Index(), and a single Dinner object in the case of Details(), Edit(), Create() and Delete(). As we add more UI capabilities to our application, we are often going to need to pass more than just this data to render HTML responses within our view templates. For example, we might want to change the "Country" field within our Edit and Create views from being an HTML textbox to a dropdownlist. Rather than hard-code the dropdown list of country names in the view template, we might want to generate it from a list of supported countries that we populate dynamically. We will need a way to pass both the Dinner object and the list of supported countries from our controller to our view templates. Let's look at two ways we can accomplish this. The Controller base class exposes a "ViewData" dictionary property that can be used to pass additional data items from Controllers to Views. 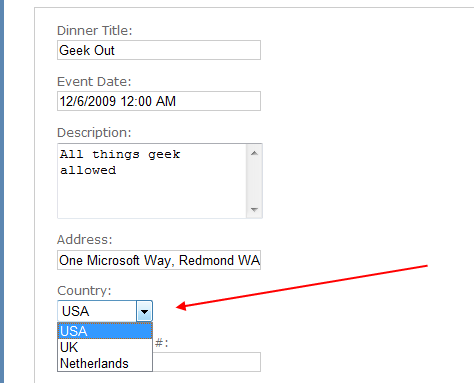 For example, to support the scenario where we want to change the "Country" textbox within our Edit view from being an HTML textbox to a dropdownlist, we can update our Edit() action method to pass (in addition to a Dinner object) a SelectList object that can be used as the model of a countries dropdownlist. The constructor of the SelectList above is accepting a list of counties to populate the drop-downlist with, as well as the currently selected value. The Html.DropDownList() helper method above takes two parameters. The first is the name of the HTML form element to output. The second is the "SelectList" model we passed via the ViewData dictionary. We are using the C# "as" keyword to cast the type within the dictionary as a SelectList. And now our DinnersController edit scenario supports a DropDownList. The ViewData dictionary approach has the benefit of being fairly fast and easy to implement. Some developers don't like using string-based dictionaries, though, since typos can lead to errors that will not be caught at compile-time. The un-typed ViewData dictionary also requires using the "as" operator or casting when using a strongly-typed language like C# in a view template. An alternative approach that we could use is one often referred to as the "ViewModel" pattern. When using this pattern we create strongly-typed classes that are optimized for our specific view scenarios, and which expose properties for the dynamic values/content needed by our view templates. Our controller classes can then populate and pass these view-optimized classes to our view template to use. This enables type-safety, compile-time checking, and editor intellisense within view templates. And now both our Edit and Create screens support drop-downlists for picking the country. In the scenario above, our DinnerFormViewModel class directly exposes the Dinner model object as a property, along with a supporting SelectList model property. This approach works fine for scenarios where the HTML UI we want to create within our view template corresponds relatively closely to our domain model objects. For scenarios where this isn't the case, one option that you can use is to create a custom-shaped ViewModel class whose object model is more optimized for consumption by the view – and which might look completely different from the underlying domain model object. For example, it could potentially expose different property names and/or aggregate properties collected from multiple model objects. Custom-shaped ViewModel classes can be used both to pass data from controllers to views to render, as well as to help handle form data posted back to a controller's action method. For this later scenario, you might have the action method update a ViewModel object with the form-posted data, and then use the ViewModel instance to map or retrieve an actual domain model object. Custom-shaped ViewModel classes can provide a great deal of flexibility, and are something to investigate any time you find the rendering code within your view templates or the form-posting code inside your action methods starting to get too complicated. This is often a sign that your domain models don't cleanly correspond to the UI you are generating, and that an intermediate custom-shaped ViewModel class can help. Let's now look at how we can use partials and master-pages to re-use and share UI across our application.